At our Thomas Kinkade Signature galleries in the Monterey Bay area, we offer a wide array of Disney collectible home decor, gifts, and wall art. Thomas Kinkade’s portfolio of Disney artwork captures the beauty of Disney fans’ favorite movies and theme parks. From nightlights to Gallery Wrapped Canvas prints you are sure to find the perfect Disney collector item, cherished gift, or accent piece to make any home feel more complete. Each Thomas Kinkade Disney movie painting tells an entire story in one image, using Thom’s signature style of “narrative panorama”. Each Disney Theme Park painting captures the magic of favorite family memories. 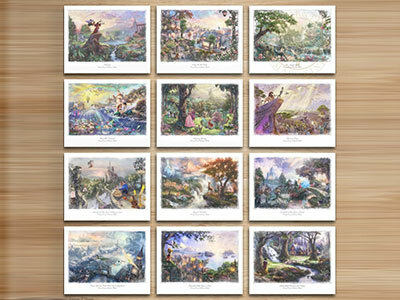 Thomas Kinkade Company Disney art is available in a variety of gifts and collectibles, including Canvas Classics, Gallery Wrapped Canvas, Framed Matted Prints, Nightlights and more. Whether you love the Disney Princesses, Winnie the Pooh, or Pirates of the Caribbean, we offer artwork that touches the hearts of Disney fans young and old. It’s never too late to introduce your favorite Disney classic to a new generation of nieces, nephews and grand-kids with a timeless gift they will treasure for life. You are never too old to love a Disney movie. Our Art Consultants are delighted to help with these exciting selections. As you see these beautiful works of art inspired by films that may have changed your life, we get to experience the joy with you first hand. Whoever said “dreams don’t come true” has never been a Disney collector in a Thomas Kinkade gallery. Choose a special art piece to celebrate your favorite modern and classic Disney movies. Our experienced Art Consultants love helping fans discover new Disney collectibles and treasures. Our artwork comes in many different editions and framing options. Giving a gift? We can ship your special selection anywhere. Come by and ask for a tour of our Disney collections today. We look forward to seeing you at one of our Monterey Bay area galleries soon.